They have removed the info then,because the link was working late last night.Maybe they have woken up to what was happening. All Men Are Fools, But A Wize Man Knows He Is. Edited because I can't remember the full story and don't want to speculate and get it wrong.All I know is the link was working last night. In the event that you may not be able to be present at the BUGU rally on Wednesday the 8th this may be a good way of making sure that your voice is heard. 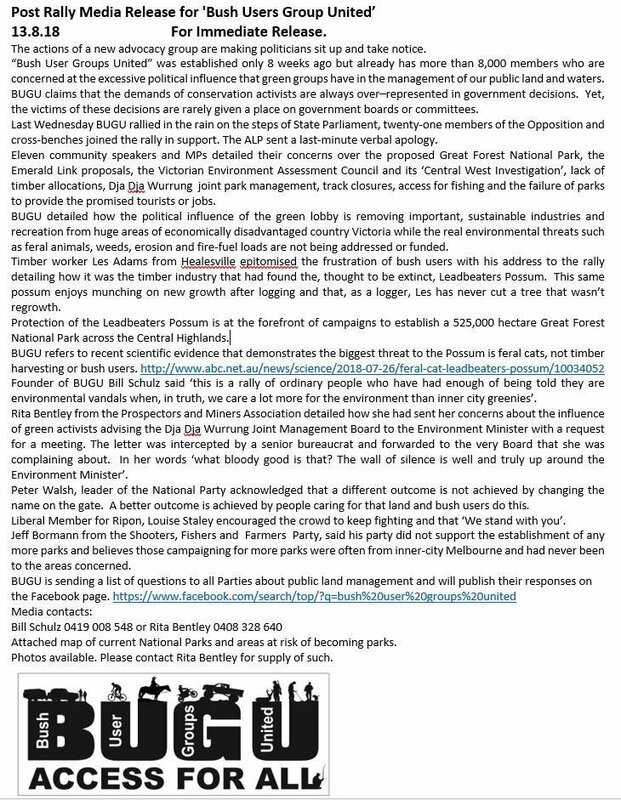 For those inclined to write to sitting members of parliament, here is a list of sitting members which you may like to contact to let them know about your concerns regarding any future changes to access of existing state forest. The correspondence doesn’t need to be long or extravagant, by simply stating your support for the Bush Users Groups United actions and your wishes with regards to access to our bush this would be a great help in our cause. So just cut and paste the emails of the major parties’ leaders, some ministers and perhaps find the your local member and let them know that you are taking keen interest in the developments. Once their inbox is flooded they won’t be able to ignore us any longer. Good work autitch I'll start bombarding them, can't make it tomorrow work takes priority during the week unfortunately. Writing to the Greens? Surely you're having me on. I mean I get why some people might think it's a good idea but if anyone can recall anytime a greens party member spoke publicly about prospecting in a positive or even neutral light please share. Last time I watched a greens member talk about highbankers she seemed very keen to explain hydraulic sluicing, a forgotten mining practice, and clearly misrepresented what we were doing, either through lack of understanding (possible ) or deliberate misinformation (more likely). Wouldn't trust one as far as I could throw one. Do more harm than good. But nonetheless a very good idea which I will fully support. Should be interesting to hear the replies. For NE Vic people, Cathy McGowan, federal Member, will be at Graya, East of Wodonga on Thursday 10 th at 10.00 am. I was at the Melbourne rally today, but won't post photos as I'm not sure some many want their mugs splashed across this forum. Was cold and wet, but a reasonable turnout. Noticeably absent were Labour and The Greens (what a surprise ). Quite a few Liberal and Nationals there to support us (Peter D and Louise S spoke well for us). Noticeable from PA were Wombat (BUGS organiser), Tathradj (one of our moderators - all the way from NSW and heading home tonight) and tryhard1968 who did a mapping poster of the areas targeted for handouts. The biggest surprise for me was the whole of Whipstick at Bendigo will be gone. The next biggest is that the Laanecoorie region will be hit along with the obvious impact on the annual Laanecoorie Gold Bash and all surrounding suburbs. 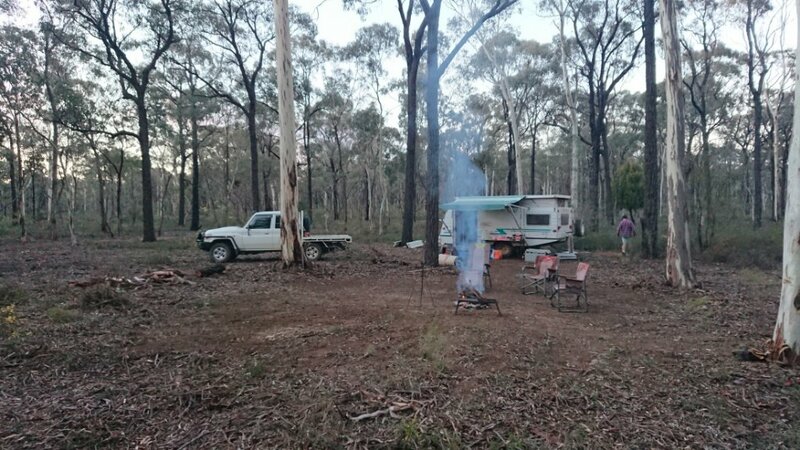 Lots of different Bush User Groups were represented, including Shooters, Deer Hunters, Horse Riders, 4WD, Trail Bikes, Loggers, Fishers and of course Gold Prospectors and Fossickers. Quite a few eye opening speeches, including: 1. a logger who stated that all logging is of re-grown wood and that they are all registered fire-fighters, and often the first there (if they are banned it will cost the govt much in terms of recruiting fire-fighters); 2. Deer hunters keep the ferals down, saving the govt about $100 for each one culled (I believe there around 1600 deer culled in Vic pa, saving the govt significant costs and providing hunters with food for families), and 3. the likely impact on the physical and mental health of not only current Bush Users, but the future generations. How do we tell our kids that we can no longer fish in most waters? Public Land is just that - for the public. 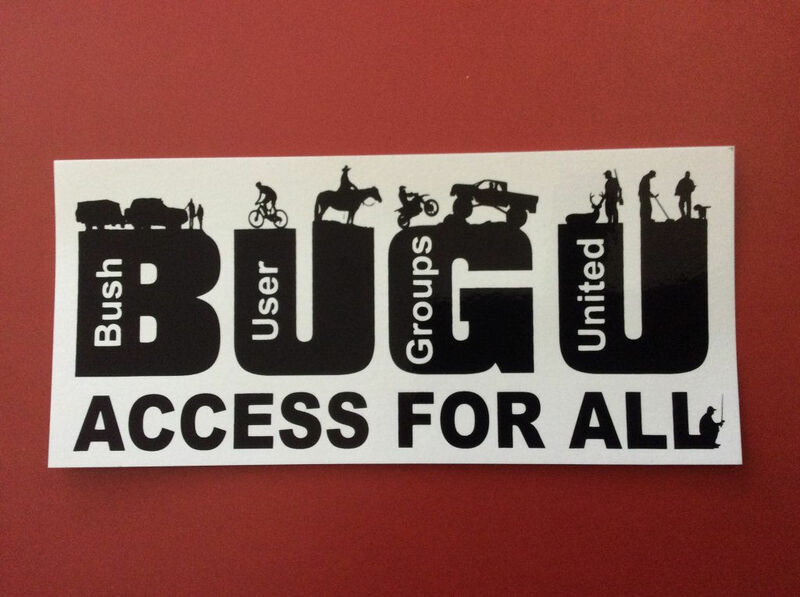 This Bush User Groups United is the only way we can win - united! Hopefully across Australia. Just to clarify my above statement this is an excerpt taken from the PMAV website. In an interview aired on Prime 7 'Prospector angry over sluicing ban', Australian Greens Lead Candidate for Northern Victoria (Jenny O'Connor) described the act of sluicing as “using high powered water pressure to erode away river banks to look for gold”, a description which seemingly sounds like “hydraulic sluicing”, a destructive form of sluicing that was banned in Australia 100 or so years ago. Hard to believe anyone would want to stop a family from enjoying this part of the world, from being able to set up for a night or two to NO you can't live a healthy family oriented outdoors weekend. Wellsford State Forest, we're up here for the weekend with Kate helping at the Bendigo Gem Club Expo so I thought why not while I can. 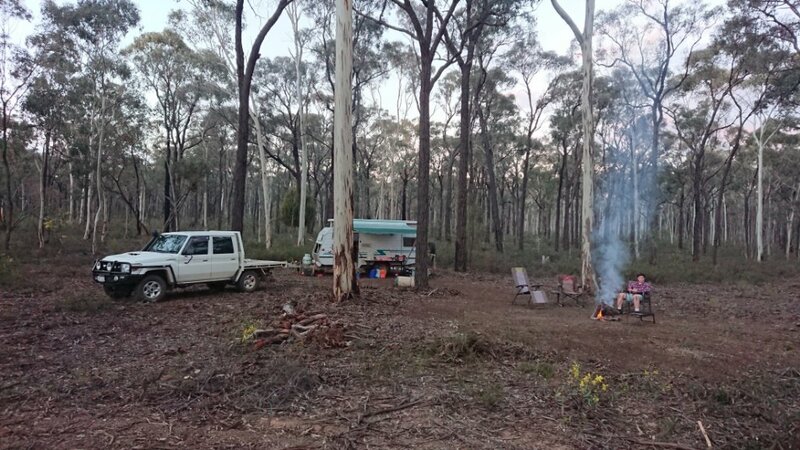 We're camped off Nash Rd near the Gunyah picnic area. Forgot to mention there will be panning for people to try and detector demo's as well. So if your looking for something to do with the family /kids it's at the Baptist Church 757 McIvor Hwy Junortoun. Doubt I'll make it there until Sunday, got to much gear to be leaving it for the light fingers I'll just hang out here and try my luck. VEAC has extended the submission deadline for its Central West Investigation Draft Proposals Paper from 31 October to Monday 10 December this year, giving members of the public more time to prepare a written submission. “There is a lot of interest in the draft recommendations and we want to provide people with the information and time they need to prepare their submissions so we have extended the submission closing date,” explains VEAC Chair Janine Haddow. All submissions will be reviewed and analysed and taken into account in preparing VEAC's final recommendations ahead of VEAC providing a Final Report to the Government in 2019. Only a fool would believe that any political party is going to take side for prospectors over another political party. Promises made will simply be promises broken. This hoo ha has been going on since when I first started prospecting in the 1970s, and it has made no difference which party was in power. The PMAV or any other group aligning itself with one political party or another is just dumb, and a waste of time. What's more, if the political party that a group backs happens to lose the next election, where do you think that will put us. I keep hearing a load of crap about the example set at Eureka. Read your history and see what the leaders did later. Feathered there own nests mostly. A confrontational attitude is playing right into the hands of politicians, who will use you and then turn their backs once elected. This is not a Eureka situation, and is insulting hearing this rubbish from puffed up nobodies who mistakenly consider themselves prospectors. Get off the soap box and go do some real prospecting. You only need to look at the shooters, the 4x4 groups, and the fishers to see where this is all headed. In all these cases access isn't like it was, and the rules have changed. License restrictions and firearms restrictions, introduction of fishing licenses, banning of nets, restricted waters and seasons, catch and release, and now targeting 4x4 mods to disable capable vehicles and banned activity in many areas. Still if people have the courage and will to fight we shouldn't denounce them. I don't make any donations to any lobby groups or political organizations for the reason you've mentioned, I think it has a zero sum effect on legislation. Instead I spend money on time in gold areas, machines, equipment and at the local businesses around those areas. I spend free time writing submissions and letting others know what we face. I spend both my free time and money a few times a year cleaning up areas from dumping, and maintaining facilities. Deep down I know it's all going to get harder and one day I'll be on the wrong side of the law. In truth that doesn't matter to me. I'll still go out there and I encourage everyone to do the same once they finally legislate against it. And I'll be a lot happier doing it because I'll be free. No more concern for my actions affecting others. Ultimately I think that's what the green movement forgets, its prospectors self regulating in the status quo that ensures we are all trying and motivated to stay within the confines of the rules, but removing our rights and access will more likely have the exact opposite effect than the one they seek. I strongly believe the wider public will either support us as outlaws or simply not care, it's only a very tiny minority that have any interest in what we do. ".... Deep down I know it's all going to get harder and one day I'll be on the wrong side of the law. In truth that doesn't matter to me. I'll still go out there and I encourage everyone to do the same once they finally legislate against it. And I'll be a lot happier doing it because I'll be free. No more concern for my actions affecting others. Ultimately I think that's what the green movement forgets, its prospectors self regulating in the status quo that ensures we are all trying and motivated to stay within the confines of the rules, but removing our rights and access will more likely have the exact opposite effect than the one they seek. I strongly believe the wider public will either support us as outlaws or simply not care, it's only a very tiny minority that have any interest in what we do." That's an excellent point made, right there, OldGT. Makes a lot of sense Reg and OldGT, I've never thought of it that way. GPX4500 / sP01 / Evo coils. Nox 600. Whites GMZ. But they are growing in numbers, Wankers breed wankers. 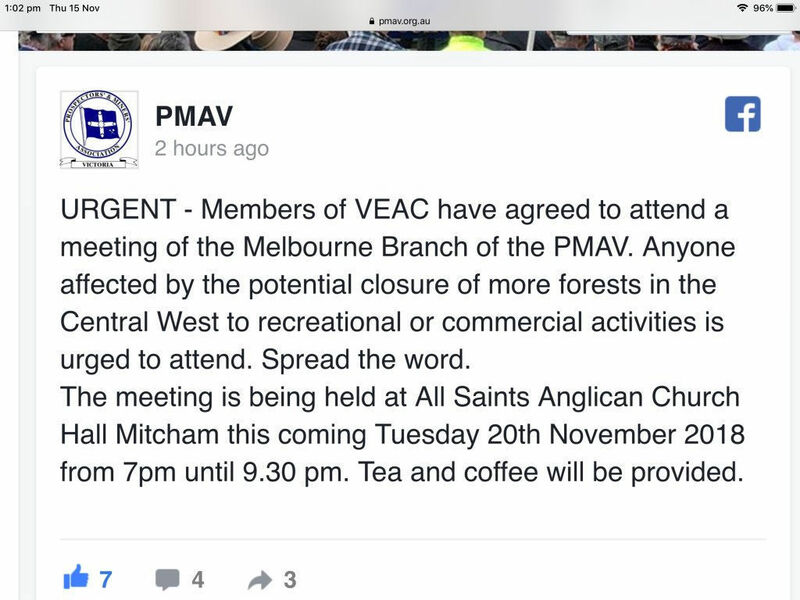 VEAC tossers are supposedly going to be speaking next Tuesday 20th - 7.30 to 9pm , tea & coffee supplied . PLEASE SHARE as much as possible ..
Hey Wombat, could we meet a few days earlier somewhere to discuss?